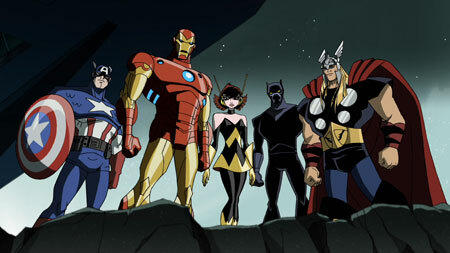 Now that Avengers: Earth's Mightiest Heroes has finished up on television it isn't surprising to see them arrive on DVD. First up was Vol.1 which introduced the main team members in isolated short stories culminating in a final two-part episode that saw the main group join forces to stop a powerful villain. Now Vol.2 arrives on DVD, picking up right after the events of Vol.1. As you know, the team vanquished Gravitron and decided that working together might be the best option now that so many super villains had escaped from each of the five prisons. The first episode to deal with that aftermath of those events is "Some Assembly Required" in which the Avengers, comprising of Hulk, Ant Man, Wasp, Thor and Iron Man, are introduced to their new headquarters courtesy of Tony Stark. Disguised as a mansion estate, in reality it is a technological wonder, burrowing deep beneath NYC. The team is unable to settle in fully as one of Thor's old villains, Charmcaster, tricks Hulk into thinking the rest of the team is out to get him. This culminates in the Hulk abandoning the team when they unknowingly attack him thinking he has turned against them. Before they can apologize, he leaves. Next up is "Living Legend" which introduces Captain America to the team. After the events of "Meet Captain America" from Vol.1 the hero of World War 2 was encased in ice and thanks to the super solider serum coursing through his body he was able to survive. After some initial shock and disorientation he joins the team as the newest Avenger. In "Everything is Wonderful" a C.E.O. of a rival corporation of Stark Industries looks to nefarious help to seek revenge against Stark. This leads to the creation of a new super villain who can manipulate energy itself. Next up is "Panther's Quest" where T'Challa, leader of the African country of Wakanda comes seeking aid from the Avengers when his people are overthrown by a despot known as the Man-Ape. The final two episodes are, again, a two-part story titled "Gamma World". In this story, the prison known as The Cube has been taken over by The Leader, a villain of the Hulk. He plans to use technology he developed to turn people into gamma infected creatures that he can control. At first the Avengers are able to put a stop to the Leader's plans by destroying his machine but it turns out it was a trial run to see the effectiveness of it and he surprises them by continuing with his plan but this time on a global scale. It is thanks to Hawkeye, who was once a member of S.H.I.E.L.D and has been on the run for several episodes in an attempt to clear his name, that the Hulk rejoins the battle. Finally putting a stop to the Leader, the Hulk is asked to rejoin the team as they simply cannot face the threats out in the world without his help. Like Vol.1, Vol.2 comes with only one bonus feature and, again, it is an interview with Producer Josh Fine and Story Supervisor Chris Yost, discussing the events of season one with a look towards season two. This time around they give hints as to the plotlines for season two, not only on a large scale but also in a personal way as well as they hint at what will be in store for certain team members. Avengers: Earth's Mightiest Heroes is a solid show that has an obvious love for the classic stories of days gone by and Vol.2 is just another way of proving this point. Purchase a copy of Marvel The Avengers: Earth's Mightiest Heroes, Vol. 2 from Amazon.com.